John Kenneth Muir's Reflections on Cult Movies and Classic TV: From the Archive: The Lone Ranger: "The Lone Ranger Fights On"
From the Archive: The Lone Ranger: "The Lone Ranger Fights On"
Then, the duo of Tonto and the Lone Ranger head to the Valley of Wild Horses, where they spy a buffalo about to stampede and kill a badly-wounded (and gorgeous) white stallion. The Lone Ranger shoots the buffalo, and with Tonto’s help nurses the horse back to health. 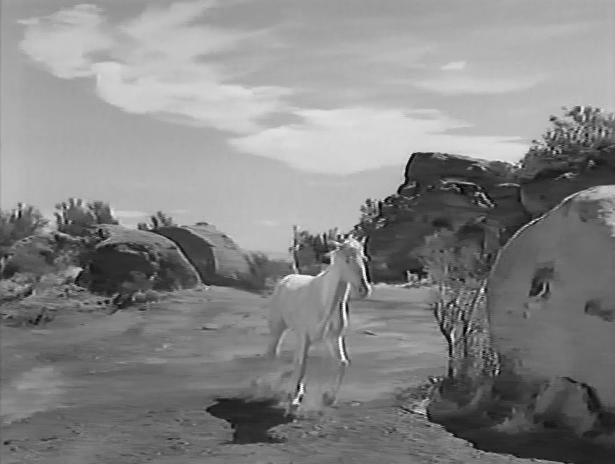 With a magnificent steed (or “dream horse” in the terminology of the episode), the Lone Ranger and Tonto head to the troubled town of Colby, where Cavendish (Glenn Strange) has launched a campaign to murder public officials and replace them with his own corrupt minions. 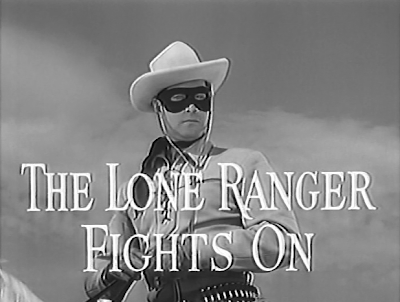 A friend of the Lone Ranger’s named Jim Blaine (Ralph Littlefield) is framed by Cavendish as the murderer of a local judge, and Tonto and The Lone Ranger decide to hide him at a nearby silver mine that the Lone Ranger once discovered. 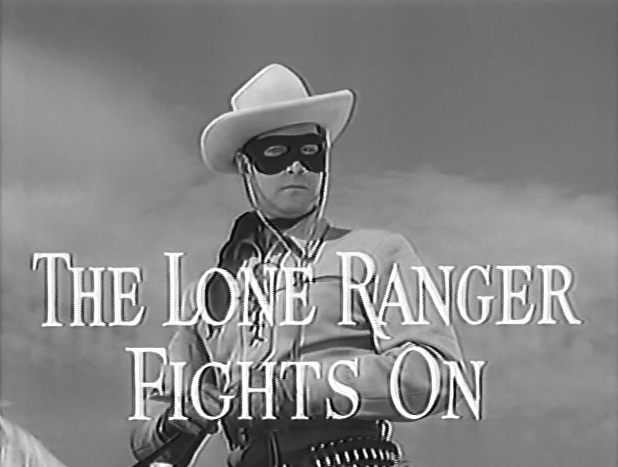 As the preceding synopsis makes plain, a good portion of this sophomore episode, “The Lone Ranger Fights On” involves the Lone Ranger’s first encounter with Silver, his famous white horse. 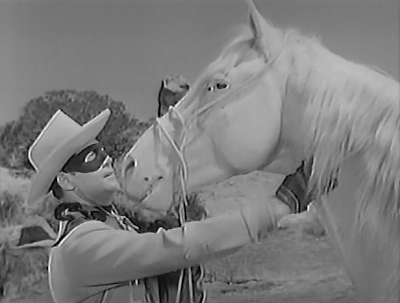 First the Lone Ranger shows Silver a kindness, by saving his life, and then freeing him. And then Silver returns that kindness by becoming the lawman’s steed. The scenes involving Silver's training are really wonderful, and it’s great to see a story in which an animal’s needs are not considered secondary to tertiary to the demands of humans. As the dialogue I excerpted above makes plain, the Lone Ranger considers himself and Silver a pair, a team. Call me mushy, but I love that. 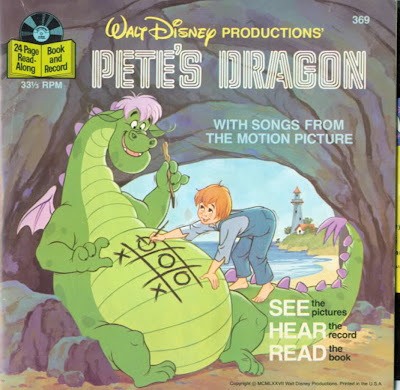 I love that a sixty-year old something TV series understands the special bond that can be created between a human and an animal. 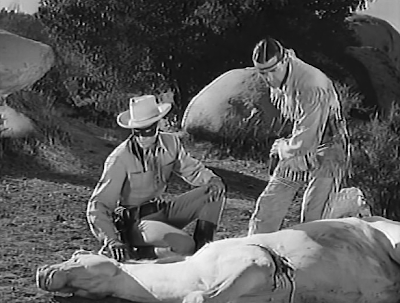 Silver bullets are also a key part of the Lone Ranger’s mythos -- even though the hero doesn’t fight werewolves -- and this episode shows Blaine refining silver for the lawman’s immediate needs, namely “money and bullets.” Essentially, the silver bullet becomes the Lone Ranger’s calling card in the lawless West. He leaves them behind in his enemies as his signature. Therefore, lawmen know he has been involved, and outlaws know...fear.